Dratzo! The delivery system is moving more slowly than liked proving to be able to move our monies through it. As usual, each new section involves delays, which center on those who either wish to steal or divert the funds in question. Our security is easily able to note how these funds are advancing, and if anything does happen, we can use our system to quickly recover the funds. Each new trial thus contains possible glitches that can be easily remedied mostly by arresting those responsible for creating yet another temporary delay. So far, we have put together a system, which is allowing us to move funds safely toward their final destination, your account. As you can see, we have been arresting bank personnel and replacing them. Our liaisons, to keep pace, have been keeping an inventory on how each section of our system encounters the stallings of the cabal. These delays are being observed and ways to prevent the abuses are being set in place. We are very close as well to moving our larger trust funds. Once this system is fully secure, the larger deliveries can happen. Gaia, as she waits for our landings to occur, is continuing to prepare for the great catastrophe that is to consume the present surface area. Over the past year, the numbers of volcanic movements, tsunamis, and earthquakes have increased. These are happening to move the surface and generally preparing you for what is to come. Earth has been in this position ever since the fall of Atlantis. She is giving us a warning to increase the speed of those changes needed to redo your global societies and move them easily into Inner Earth. We are aware of this and have informed our earthly allies to permit the prerequisites needed for us to land to be greatly increased. Gaia deeply desires to return herself to her former 5-D self. It makes her uneasy to have this split between an inner 5-D reality and an outer 3-D realm. This is why the so-called death spiral is increasing through her various surface ecosystems. Your abusive societies are only aiding her in this mass effort. The cabal realizes that its dominance on your world is rapidly fading. These rapscallions understand that their use of war, chaos and discord are no longer achieving the same results. Thus, they are threatening to create vast catastrophes in the global economy. We have countered this by forging alliances to prevent such childish behavior from thwarting what lies ahead. So far, these actions are holding off the cabal. What is needed is a way to have our allies quicken the pace of what they are doing. A number of new actions for a much faster fund transfer system are ready, and soon, with the help of our allies, we can begin to pull the plug on a “SWIFT” system that is at the heart of these numerous delays. In addition, a vigorous new infrastructure-building bank is getting ready to bypass the present unwieldy banking system. The cabal is seeing that its mighty “Fed dollar” is beginning to collapse. A new freedom-laden, prosperous realm is now nearly ready to manifest. Hosanna! Hosanna! Namaste! We are your Ascended Masters! Our associates are extremely joyous over what is currently happening. We are approaching the very edge of the time when the dark cabal falls and the era of the dark is finally over. 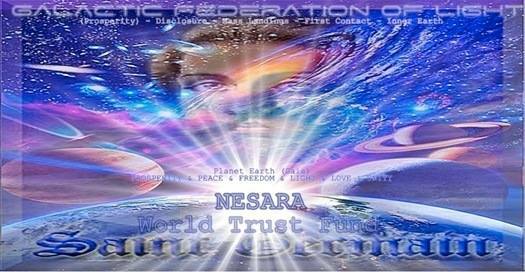 The most important element of this is the declaring of the NESARA law in America. This moment is to be one in which Heaven’s blessed decrees are to be manifested. We are joyous that the reality imposed by the dark on surface humanity is to end. The plan is to put away those who for so long terrorized you and produced an era in which your freedom was lost either due to their whims or to the very nature of debt slavery. This is to be replaced with a vast set of knowledge, which we intend to impart through our many coming lessons. You need to flush away the veneer of lies and mistruths, which the dark used to rule over you. These new realities are just the beginning of what you need to know. The coming times are to be ones of great change. The demise of the dark is to open up opportunities for the Light, to teach and explain how this new reality is to operate. In the past, you were subject to lies and manipulation, which prevented you for millennia from easily discovering the truth about how this realm operated. Now, you are to become more conscious of what is happening, both locally and internationally. This outflowing of truth is to add to what we fully intend to tell you shortly. Each of our lessons is to be designed to teach how you can increase your ability to self-discern and to show how Creation works daily in this realm. Heaven intends to have us explain your history and why you need to abandon these surface lands. You need to become guardians of this sacred place and the other water planets of this solar system. You are indeed destined to be one of the main guardians of these most noble worlds. As you do so, you are to learn things that are to permit you to see just how sacred this divine task truly is. Many millennia ago, we learned from our Agarthan family what a special task this truly is. Those who now occupy the present worlds of this solar system have told us just how dear our task really is. Thus, we look upon our task to be merciful and gracious to all humanity and to our sacred mother, Gaia. Heaven permitted us to go through a sacred ceremony and to be taken under the wing of our predecessors. In turn, we have learned from our many daily tasks how best to serve you. We bless you and bless Heaven for her help. We are proud of each of you. Know deep in your hearts that this world of silent suffering is ready to be transformed by all!